It was the play, of course, that gave us many of the familiar characters: the Lost Boys, Captain Hook, the fairy Tinkerbell, and the Darlings. Wendy Darling is often called the first Wendy, the girls’ name having originated in Barrie’s play – a nice fact, if only it were true. In fact, the name Wendy had been used as a girls’ name since the nineteenth century (as a pet form of Gwendolyn) and there is even some evidence that, before Barrie popularised it as a female given name, it was used as a boys’ name. 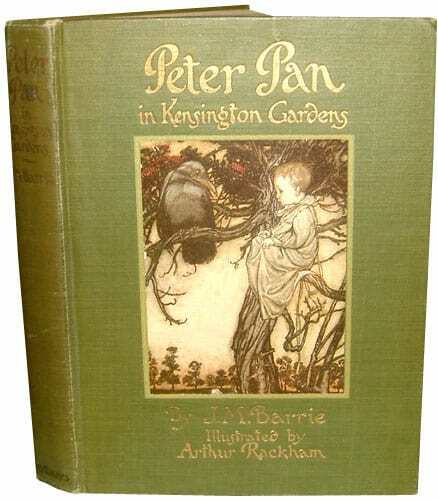 Nor did he invent Neverland: the word’s first use is credited in the OED to a Sydney newspaper in 1892, twelve years before Barrie put together his play and invented the idea of a mystical world beyond the ‘Mainland’ of the normal world. Similarly, Never-Never Land (the other name by which Neverland is known in Barrie’s writing) is another Australian coinage, dating from 1884 as a term for the remote outback, or ‘Never-Never’. The term ‘Never-Never Land’ as used to refer to ‘an imaginary, illusory, or Utopian place’ similarly predates Barrie, first appearing in the Cornhill Magazine in 1900. Something Barrie did give us was Quality Street chocolates – or, rather, the name for them. One of Barrie’s less well remembered stage works was the 1901 comedy Quality Street, set during the Napoleonic Wars. The play was only a moderate success and is not read much now, but its lasting legacy was in providing the confectioners, Mackintosh’s, with a name for their new chocolates in 1936. Indeed, the Major and Miss, the two characters who appeared on the packaging for Quality Street chocolates until 2000, were an allusion to their literary origin: they were two of the characters in Barrie’s play. So does the “Wendy House” originate from the house Peter commands the lost boys to build around Wendy’s after she is shot by an arrow from Tootles? I wrote my master’s thesis on the Peter Pan texts. I think they’re one of the best examples we have of an author’s revision of his own work, and their generic conflicts (myth, fantasy, fairy story, panto, island fantasy) make them even more interesting.